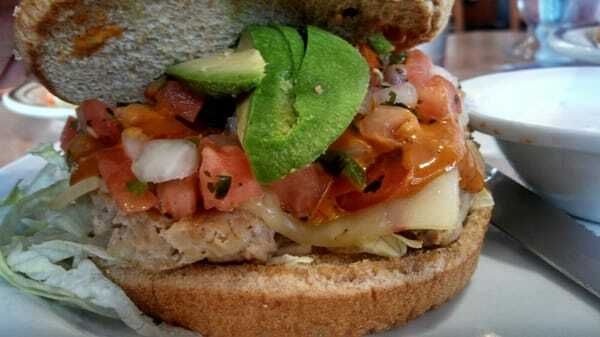 Split bun into halves, and top the bottom half with lettuce and salsa or pico de gallo. In a small bowl, combine mayo, BBQ sauce, and hot sauce. Mix well. In a medium bowl, thoroughly mix turkey with seasonings. Evenly form into a patty about 4 inches wide. Bring a grill pan (or skillet) sprayed with nonstick spray to medium-high heat. Cook patty for 5 minutes. Flip patty and cook for 3 minutes. Top patty with cheese and continue to cook until cheese has melted and patty is cooked through, 1 - 2 minutes. Transfer cheese topped patty to the bottom half of the bun. Top with sauce mixture, avocado, and the top of the bun.